Today I’m interviewing Michael G. Williams, who has just released his new book, A Fall in Autumn, with Falstaff Books. Here’s a bit about him. Follow Michael on Facebook by clicking here. DP- How did you decide to write in your genre? MW- I’ve always loved science fiction. As a kid, I identified very strongly with science fiction characters’ strong sense of needing to go somewhere else to find themselves, and to find the truth of their circumstance and environment. Whenever I’m a guest at a fandom convention I ask for a panel on queer fandom, and on that panel, I always ask the other panelists if their queerness led them to fandom or if their fandom led them to queerness? I feel like that question prompts us to go back to the heart of why we love a genre, the moments when we became fans, which in turn is what made so many of us want to create in the first place. For me, the answer is very clear: my queerness led me to fandom. I knew I was different. I knew I was going to have to go somewhere far away to find out who I was, to discover my own horizons elsewhere. That made every science fiction show – especially the ones about people who constantly moved around, or had to abandon who they used to be in order to survive – exceptionally compelling to me. I also write horror, which is another thing I’ve loved since early times. I grew up in a place where fear was a very common feeling: fear of the woods around us, the shadowed corners of mountains and hollers, and the wildlife pressed close around us, but also the people. Even in the ’70s and ’80s, there were people running moonshine stills around us. My grandmother taught me how to recognize the smoke from them so I could avoid, as she put it, “walking up on one and getting shot.” We were also constantly told the supernatural world was real, all around us, terribly dangerous, and the only way we could be saved. The same cosmology that was supposed to save us was constantly threatening us. How could I not write horror after a childhood sopping wet with that? 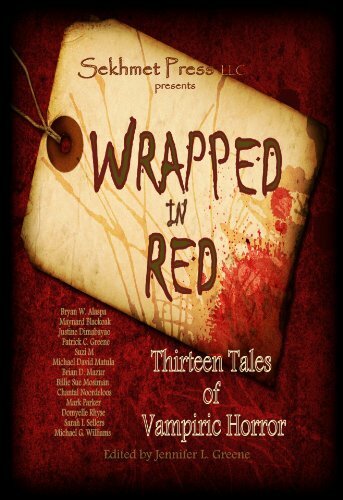 Find one of Michael’s stories in this horror anthology. DP- What’s the easiest or hardest thing about writing for you? MW- The easiest thing, by far, is coming up with the beginning of the story – the very first scene – and the ending of the story. I always know where a book starts and where a book ends. I can never tell what’s supposed to happen in the middle. Plotting in advance always sort of turns out to be wasted effort for me. Outlining is largely an exercise in discovering how wrong I am about my own book. In the end, to get words on the page, I throw my characters at each other and see what they do. It feels gimmicky to say characters have a life of their own and surprise me, but they constantly surprise me. That was especially true in A Fall in Autumn. Valerius is a new character for me. This was my first time writing him. He was constantly jerking the wheel from my hand. DP- Tell us about something in real life that inspired a character, setting, or plot in one of your books. MW- Oh, gosh, where to start? In A Fall in Autumn, several places are inspired by real places I’ve visited. There’s a park called Down Preserves and I always imagine it composed of several different locations within Golden Gate Park in San Francisco. There’s also a public fountain, Lotta’s Gift, which is directly lifted from San Francisco’s Market Street. The implication is meant to be that big chunks of Autumn were based on the records its builders had of San Francisco before the cataclysmic dark ages between our current time and the time period of the novel. The five novels of The Withrow Chronicles are all set in North Carolina, and draw heavily on real places I’ve been. The neighborhood where Withrow lives (featured mostly in the first book, Perishables) is the neighborhood where I house-sat for a summer in college, and his house is that house. It was an oversized family home in a somewhat ritzy suburban neighborhood and I felt so out of place living there on my own as a kid of 19. I stayed in a sort of mother-in-law suite in the basement and I felt very much like a creature of the night tucked away amongst the normals. The third book, Deal With the Devil, is set in Durham, where I live. There’s a 22-mile pedestrian and cycling trail running through town – the American Tobacco Trail, named for the railroad it replaced – and at a specific point on the Trail there used to be a dilapidated and abandoned log home one could see from the Trail behind it but not from the street in front of it. The house was white- and black-painted logs, alternating, with huge picture windows long since smashed and covered over with plywood. It had a very Art Deco look to it, and it was easy to imagine that it was once a very stylish country home. By the time I noticed it, it had sat empty long enough that fast-growing pines had overtaken the front yard and completely obscured it. Drive by and you’d never know it was there. The first time I saw it I thought, A vampire lives there. The fourth novel, Attempted Immortality, takes place entirely in the town of Sunset Beach where my husband and our friends and I go for a week every Spring. And there’s a megachurch in the fifth, Nobody Gets Out Alive (coming out later this year from Falstaff Books) based directly on a terrifyingly mechanical-looking cathedral in Charlotte, NC. Real world locations are a huge part of my writing, and very important to my process. I almost never import actual people. I import lots and lots and lots of real places. DP- What do you do when you’re stuck on a scene? MW- Usually I have another character walk in and start talking with no idea what was going on. Instead of Chandler’s advice about sending in a man with a gun, I send in a character with some dialogue. Heh. I love to write characters talking to one another, philosophizing, sharing their views and beliefs. I love to watch them try to influence each other. That’s always easy for me to write, and a lot of fun to write because I basically treat it as a roleplaying exercise. That always gets my fingers flying. DP- What does a typical writing day look like for you? MW- If I’m drafting, rather than revising, I have to go to a place where absolutely no one will interact with me or require anything of me. There’s a specific coffee shop here in Durham (shout out to Bean Traders, woo!) where I do all of that work. I usually revise there, too. Many years ago the owner’s husband jokingly declared me their Author Laureate, which always gives me a warm fuzzy when I think about it. It was one of my earliest encouragements from someone who didn’t really know me. But now I’m rambling. A typical writing day for me means getting up, going to the gym to get my blood pumping and my brain in gear. Then I head next door to the coffee shop, put on the headphones, fire up some dance music, and start writing. I try to write for three or four hours uninterrupted, which usually gives me some decent output. Then I take maybe half an hour to look at my phone and catch up on emails and wind my brain down, then back home. I only do that on weekends, and usually only on Saturdays. My output is pretty slow compared to other writers because I just can’t write on days when I have to go to my day job. My 9-5 job is mentally taxing in a different way but leaves my brain too tired to write. Magical beans that help writers turn ideas into books. Now that’s alchemy! DR- Is there a sub-genre in Sci-fi or Fantasy that you don’t like? Why? MW- I’m not a huge fan of military sci fi, because it speaks to a set of experiences I can’t really relate to and what very little of it I’ve read seemed to go out of its way to reinforce some of the worst of toxic masculinity. (Please hold while I am buried in hate mail. 😀 ) I know there is good military sci fi out there, because I know some very smart people who are dedicated fans of it, but it’s never grabbed me. I would welcome a recommendation of something awesome and complex and diverse! DP- Is there a common theme or element in your work? MW- Outsiders finding their people and the place they can call home. I grew up in a very isolated place and, as a gay kid in the ’80s, felt tremendously ostracized from the people I was told over and over again were supposed to be my built-in support network. I was lucky to make a few truly amazing friends in high school, all of whom felt just as out of place as I did, and we kept each other alive in some exceptionally hostile territory. In college, I continued to grow that network of warm and welcoming and truly supportive friends. I’m very lucky to have maintained those friendships over the decades, and those people are the family that matters to me. I’m not sure what would have become of me if I hadn’t found those friends. Almost all of my writing is about people who similarly feel like they are trapped on the outside, like the world just has no room for them in it, who find the people they need in order to find their place. I find that so powerful as a story. I write about some fairly grim topics – murder and death and monsters and people who are dead who wish they weren’t and people who are alive and wish they weren’t, people who have decided it’s okay for them to hurt others in order to survive – but I always want that vein of hope running through the story. I want people to read my books and feel like, no matter who they are, no matter how critical the voices in their lives or in their heads may be of them, that there is a place for them, and people who need them, and the people they themselves need. DP- What’s the most common misconception about writing you’ve heard. What is the real story about it? MW- “Write what you know.” Good grief, if any piece of advice has ever needed to be killed once and for all, it’s that one. I don’t want to write what I know. I want to make up fantastical new places and people and problems and ideas. I want to stretch the horizon of my imagination. I want to make a terrible mess out of fiction and then have the tremendous privilege and pleasure of fixing it. And I don’t want other writers limited to what they know, either. Where would we be if Anne Rice stuck to what she knew? Mary Shelley? Bram Stoker? Terry Pratchett? Ursula K. Le Guin? Neil Gaiman? Mercedes Lackey? Octavia Butler? Isaac Asimov? Sure, there are things from each of those writers’ experiences that show up in their work, but, like, just take Octavia Butler as an example: Parable of the Sower is an amazing apocalypse novel about a world that has ended and doesn’t realize it yet. Gods, look at Fledgling, which is only the most disturbing horror novel I’ve ever read. Both of those retell some part of Butler’s own experiences, especially her experiences as an African-American woman, but my gods, they are also both absolutely staggering works of imagination and craft, chock full of surprises, intensely personal and intimate. They’re both breathtaking in their creativity. I don’t want writers to stick to what they know firsthand. I want them to show me the worlds found only in their minds. DP- Where can we find your books? Which one should a new reader start with? MW- The best thing to do is probably to sign up for my monthly newsletter, which includes an ongoing short story. It’s where I talk about whatever is new, or spotlight something written by a friend or from my own back catalogue. Subscribers also get to download one of my favorite short stories, a science fiction/horror story set in a computer dating agency in the 1980’s. Be sure to check Michael’s work out. You can also @ him on Twitter. Thank you so much – it was a real pleasure to do this!